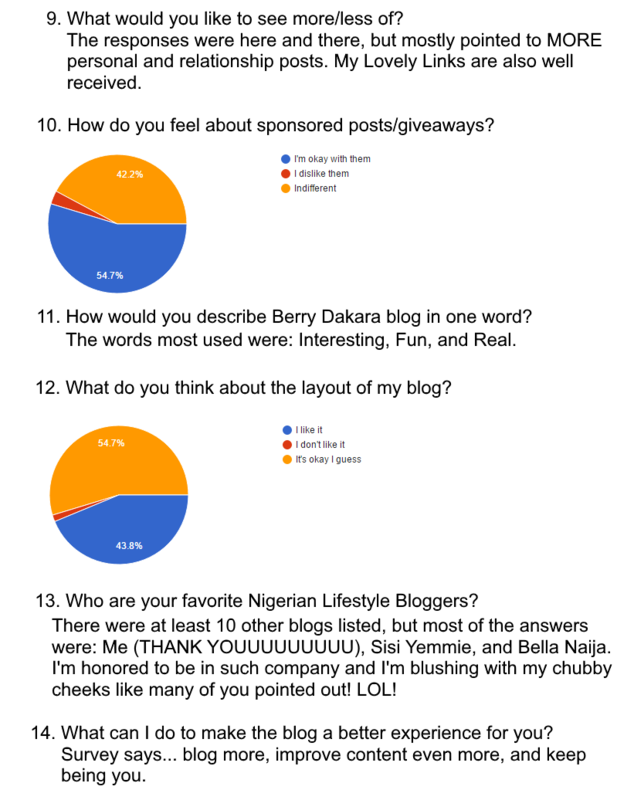 Berry Dakara: Berry Dakara Blog Reader Survey Results!!! Thank you to every single person that responded to my survey. I was pleasantly surprised by the number of respondents - 64! And I thought I would have like 20 people, or highest 30. So I humbly say thank you and would like you to know I'm doing both my happy dances! I promised to share the results, innit? It's in several images and I hope you all can see the results. It's quite transparent of me to share responses to all the questions, but I think it's fair. I learned quite a bit from the survey responses. I think it's important in my Self-Development as a Blogger. Doing the survey wasn't part of my 2016 Blog Goals, but it should have been. I made sure to put it down in my Blog Planner though, and writing it down is what helped me remember and make sure I got it done. 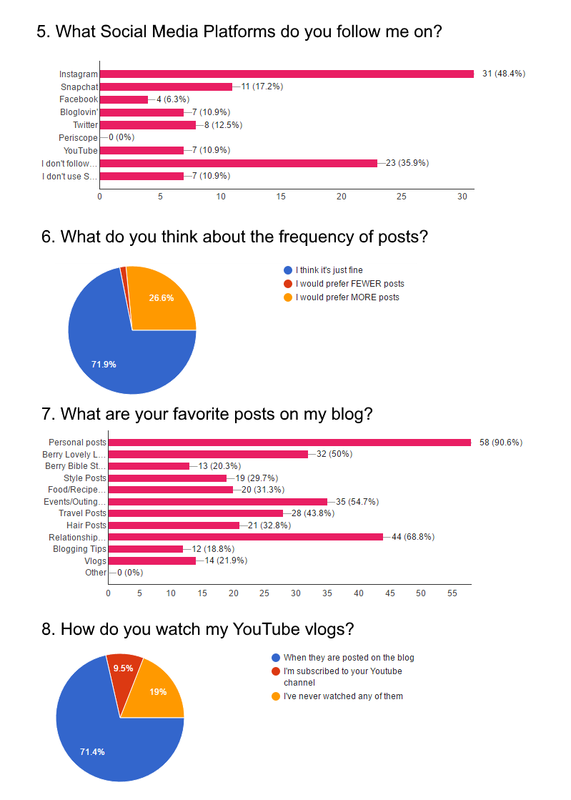 Doing a blog survey periodically, maybe annually or every two years, is necessary in my opinion. It helps give you a clear look at what your audience wants, and if they are getting it from your blog. 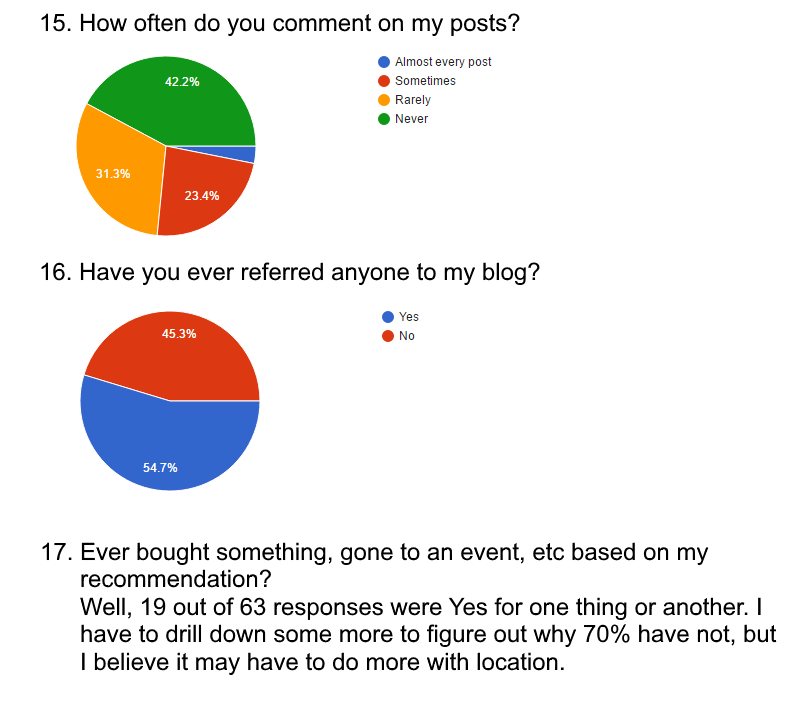 Blog surveys help you assess your content, make amends where need be, and set better goals to get traffic to your blog. I definitely need a new blog design. I want my blog to be aesthetically pleasing and not just ok. I can be a bit too hard on myself regarding the blog. For the most part, you guys like the content and suggested minor improvements. 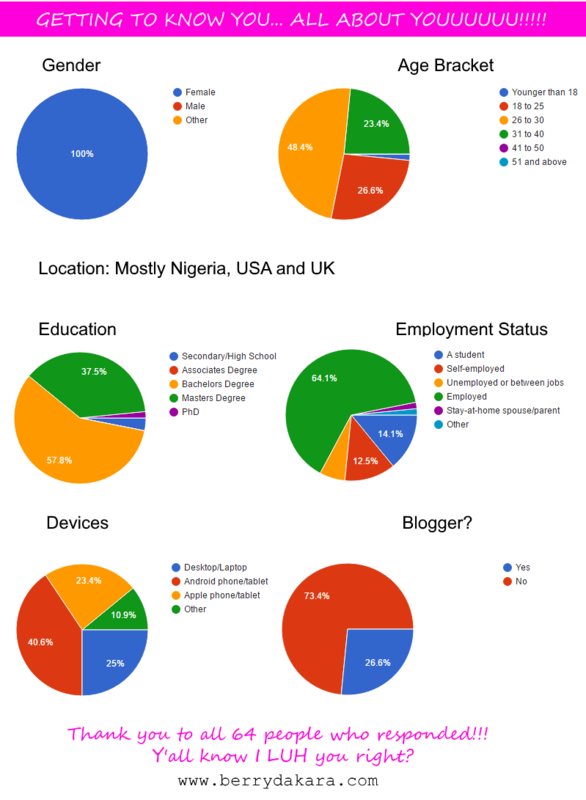 I need to do better in promoting my social media channels via the blog, and vice versa. And finally, where are the men and why didn't even 1 respond to the survey?!?!?!? I know you're out there! Thank you everyone once again! I'm sending hugs, kisses and love to you! Yes ma'am, you were. Men sha. I know they're out there. I love those responses! 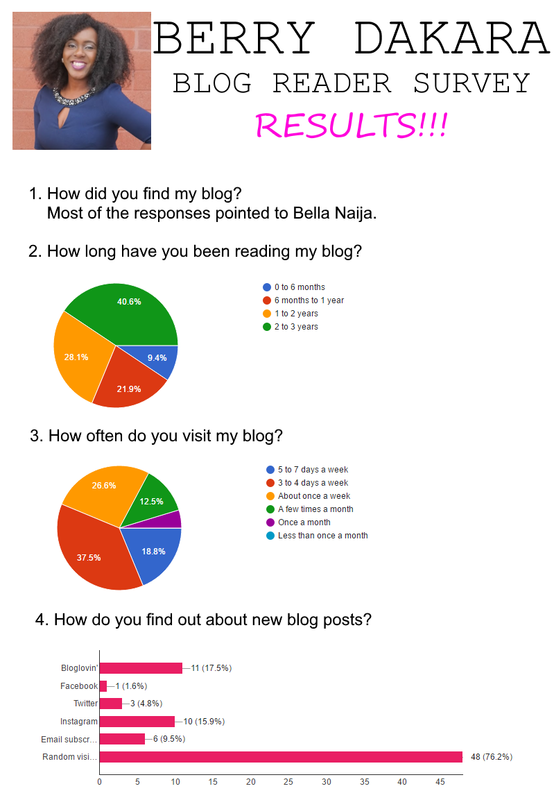 Writing for Bella Naija is a sure great way to pull traffic. You could check etsy.com for cute professional blog designs. Also, I'll suggest you remove 'blogspot' from your domain name. You could redirect this address to berrydakara.com. I love the simplicity and realness of your blog. Keep doing you! Yup, BN is a good platform. Thanks for the plug Berry! Your blog is actually one of my absolute favorites. I found out about it on Bella Naija as well as from some PH friends. (We may have some mutuals from RA, Lol). Ironically I hardly visit BN these days cos it's changed so much from th BN I once loved. I think your selling point is that you're true to yourself and down to earth, hence very relatable to people like me. Whatever you do, just dont remove your personality from it because that's what makes this blog awesome! We have mutual friends?!?!?! Oya email me and tell me who! I responded to the survey. I think you should have added blogger dashboard, cos that's how I find out about your new posts. Do a lot of people still use Dashboard though? Thanks Berry for the shoutout!! !